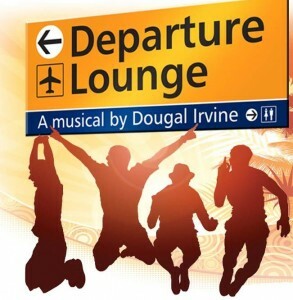 Departure Lounge is a new musical by Dougal Irvine at the Waterloo East Theatre, a new theatre in the already hugely crowded Waterloo area, but it feels like a nice new space. A converted railway arch, the auditorium is a long, relatively narrow room and has the feel of the Old Vic Tunnels working space but with less damp and cold and slightly more comfortable seats. It is a show that has been long in gestation: Perfect Pitch Showcase winner in 2006, it has been workshopped under the name Unzipped!, it has had runs at the Edinburgh Festival and also in New York before arriving here at Waterloo East. Four eighteen-year-old boys are stuck in Malaga airport after a post-A-levels but pre-results blowout holiday on the Costa del Sol, and whilst killing time they reminisce about the drink-fuelled antics of their week or at least they try to as it seems that they can’t agree on everything. Most of the confusions centres around the character of Sophie, with whom they have all had some kind of contact and through a flashback from each boy, they start to piece together what really happened and secrets start to tumble out in the airport. It is lots of raucous fun: it is stuffed full of really funny songs, the opening ‘Brits Abroad’ has a nice laddish swagger, ‘Spanish Hospitality’ pokes fun at the British colonisation of certain stretches of the Spanish coast and ‘Why Do We Say Gay?’ is a hysterical defence of the use of a gay as a derogatory term. The rowdiness continues in the interactions between the characters too, capturing the ignorance and brashness of teenage boys free from parental control: I never knew what a Spice Girls workout was until now and I’m not so sure I’m better for knowing!! 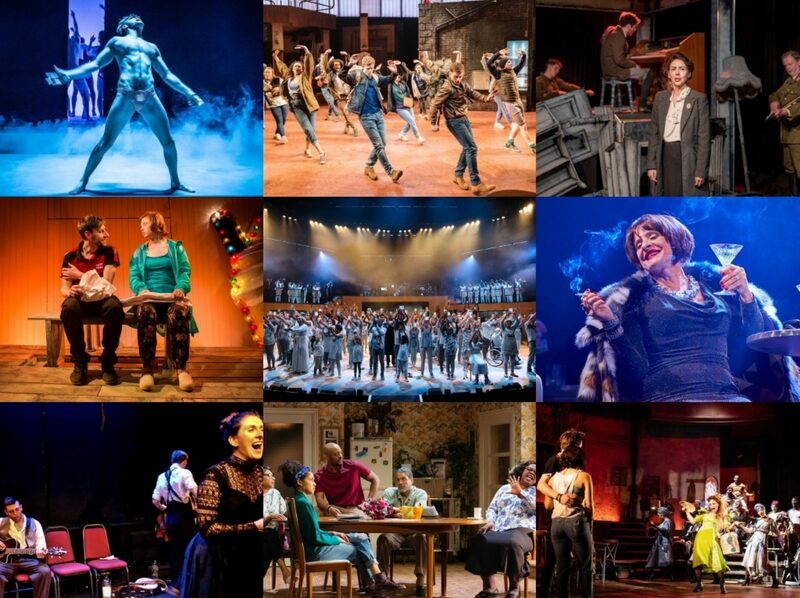 But with the fun and games comes a more serious side as the facades that they all put up conceal any numbers of hidden fears and doubts and the exploration of them is at once the main strength and weakness of this show. It hits the mark or near on the serious level too: the way that holidays can stretch even the strongest of friendships to breaking point; the reality that some childhood friendships are just ones of convenience and the intoxicating freedom that leaving home for uni offers, being able to make friends with kindred spirits rather than the people on your street; the insensitivity of the language used by teenage boys, especially to those questioning their sexuality; even the sheer frustration of flying with budget airlines! I just wish the book had focused a bit more on developing these in the book as well as in the songs, instead of continually reverting back to the brash vulgarity of their laddish communications. A perfect case in point was Jack Shalloo’s Pete, an orphan concealing huge pain beneath his bolshy exterior but only allowed the one moment of real vulnerability in an excellently sung ‘Picture Book’: all his spoken lines contained an expletive or six. Chris Fountain impressed with some nifty rapping as JB but again was only really allowed to explore the deep loneliness of his rich kid with few friends through the medium of song. Although in this case, in a duet with Steven Webb’s Ross, ‘Do You Know What I Think Of You?’ provided probably the show’s emotional highlight with a carefully constructed lyrical masterpiece that was just excellent. Webb is also strong as the sensitive Ross, nowhere near the same ‘lad’ as the others and rather sweet in his gaucheness. But it is Liam Tamne who emerges as the strongest member of this ensemble. Partly because he is given the biggest character journey, but also because he is by far the strongest singer and dancer on the stage. He does well to somewhat mask his dancing skills to fit in more with the others, but his vocal efforts are stunning, whether it is in his moving solo number ‘Secret’, or providing the astonishingly powerful top line of harmony in at least two songs. Last but by no means least, Verity Rushworth is brilliant but criminally under-used as the enigmatic Sophie, her song ‘Brand New’ is very funny and crying out to be used in future showcases and her brusque Northern Irish flight announcer got probably the loudest laughs of the show. In what looked like a brave decision, the band is made up for just two guitarists, playwright Irvine and Spesh Maloney who is also the musical director, but it really works. Both dressed as pilots in mirrored shades, they managed to cover the entire score most effectively, Irvine having thrown in Britpop, flamenco, a bit of Country & Western, barbershop quartets, beatboxing and some serious power-ballading amongst others into an eclectic mix which is surprisingly cohesive. Cressida Carré’s choreography showed a restrained touch, remaining on the right side of blokey for the most part and a fun cheekiness to the boyband and line-dancing routines. Yes, I wanted more depth and less swearing, but the reason I was frustrated is because when Departure Lounge is good, and it so often is, it is excellent and genuinely funny and I believe that with a bit more tinkering, it could improve even more. But by the time they are reprising the stirring final number ‘Left Spain’ with its lovely harmonies and its acknowledgement of the changes that have occurred, most of my misgivings had melted away and I left the theatre safe in the knowledge that there’s a cast album on the way so that I can listen to these songs again and confirm to myself that this really is quite a clever and funny new musical. post-Corrie, I'd tip Chris Fountain as a potential Warner in Legally Blonde. Thought Jack Shalloo was disappointing as the musical Hamlet – feels like he's first off a stand-up who's doing stage and musicals because the pub gigs don't pay enough.